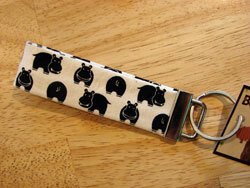 Our Hippo Print Key Fob makes a fun and affordable stocking stuffer for the hippo lover on your list. These key fobs can slip onto your wrist for hands-free use when you've just got too much to carry or handle. Comes with a large sturdy key ring. Made for Hippo Mojo by Bungle Bear Designs. Only one left in powder blue!